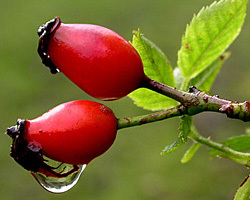 Rosehips tea is tasteful, prepared from the hips of the rose, which is the small bulb beneath the flowers of wild roses. It has been used for centuries to assist in the remedy of various ailments and as a nutritional supplement for those lacking specific vitamins. This nutritious tea is excellent in providing many essential vitamins and nutrients. It is particularly packed with a high concentration of vitamin C, which makes it highly useful for women that are pregnant. It is also useful for people that are deficient in vitamin C or can be simply enjoyed by those that wish for that added support in their immune system. When it comes to the expansive list of benefits that rosehips has to offer one must keep in mind the wise advice that too much of a good thing can sometimes be bad for you. Since rosehips tea has a very high concentration of vitamin C, there are occasionally side effects that can be experienced after drinking rosehips tea. Luckily, none of these side effects are cause for alarm, although awareness of them can allow you to more fully enjoy what this tea has to offer. The side effects that do have a potential of showing are: slight nausea (especially if it is taken without having eaten prior), stomach gas, or general stomach upset. Even less common reported side effects are headaches and dizziness, but cases of these side effects are very rare. People that are pregnant, nursing, on medications, or have history of diabetes should always be sure to consult with their physician prior to drinking rosehips tea so that they don’t experience any complications. 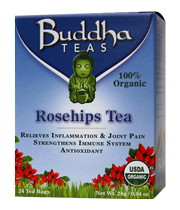 Rosehips tea has been used for centuries for a variety of healing purposes, particularly in women. 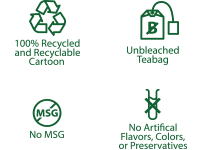 See the many benefits this tea can offer to women that are breastfeeding.